iFix 爱修网RT809F应用交流会员注册 技术求助区 专业液晶维修 编程器官方网站RT809系列编程器软件发布专用链接*********************************************************************************[/backcolor][/backcolor]中文版下载页面（Chinese version）：[/backcolor]https: ...RT809F,软件,最新 - Powered by Discuz! Address: N 1523, Unite 10, level 4, valiasr street, between the Valiasr junction and the Taleghani junction, Tehran, Iran. Я опубликовал только копии дисков, но я не являюсь составителем их содержимого. I have published only copies of DVDs, but I am not the originator of the content. Hi, If I am my name is Daniel Argentino am electronic technician and I work for service TV, LCD for over 20 years thanks to respond in Spanish, if I want to buy a RT809F programmer, but I have the files for the flash and I lack a lot of information on how to proceed, the last one S19SA300 Samsung monitor while updating the firmware and cut power monitor relit not try reprogramming the w25x40 on an external programmer but did not work with any files, so I am a little lost and come to this forum very interesting, I found many programmers as RT808U, RT809F, v29plus, but not which reaches Argentina and is the most comprehensive MCU Samsung and others. I welcome your comments Greetings! HOLA, si soy Argentino mi nombre es Daniel soy tecnico electronico y me dedico al servicio tecnico TV, LCD por mas de 20 a&ntilde;os gracias por responder en espa&ntilde;ol , si me interesa comprar un programador RT809F, pero no tengo los archivos para la flash y me falta mucha informacion de como proceder , me paso que el ultimo monitor un S19SA300 Samsung mientras actualizaba el firmware se corto la energia y el monitor jamas volvio a encender intente reprogramando la w25x40 en un programador externo pero no funciono con ningun archivo, asi que me veo un poco perdido y llegue a este foro muy interesante, encontre muchos programadores como RT808U, RT809F ,V29Plus pero no se cual llegue hasta argentina y mas completo para MCU Samsung y otros. Espero sus comentarios Saludos!!! Do you want to update the firmware via VGA port ? If it is true, you need a programmer like RT809F. 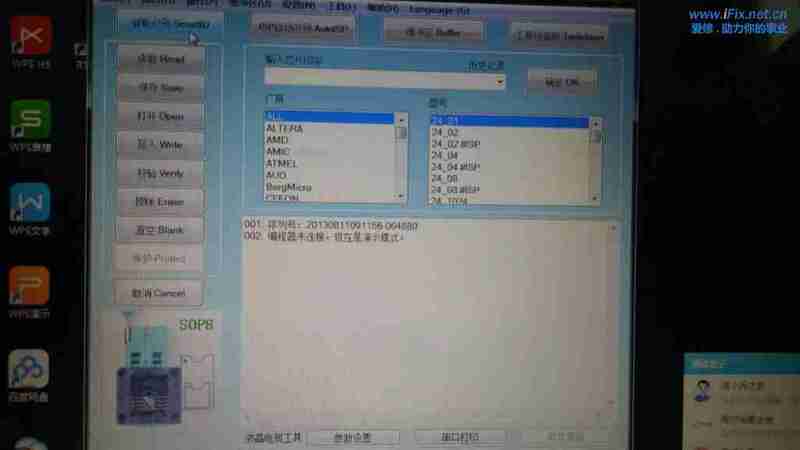 Now,you may download the firmware and reprogramming on your external programmer.Good luck. So far RT809F is the most comprehensive ISP programmer for LCD TV and monitor. The English version of our forum will be launched next week. Yes. The English version will release soon. 2019-4-25 22:19 GMT+8 , Processed in 0.095064 sec., 18 queries .